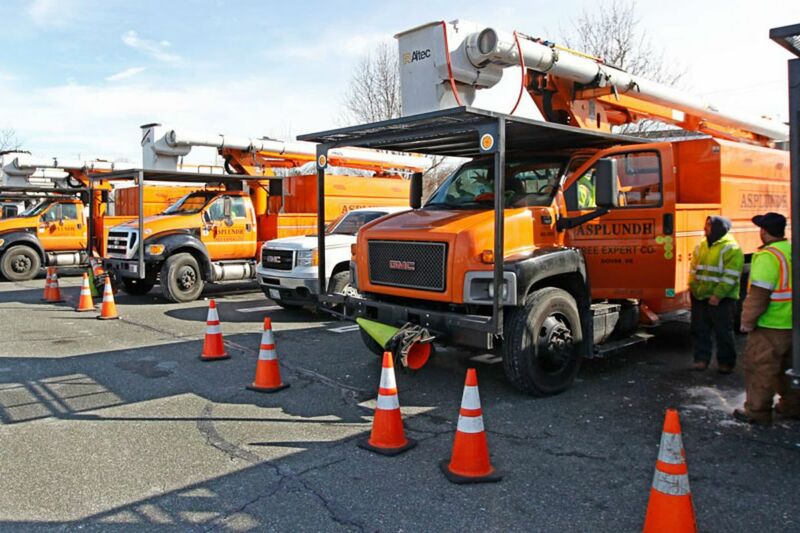 A row of Asplundh Tree Service trucks sit in the parking lot of Loews in Plymouth Meeting waiting to be dispatched by PECO to clear tree limbs off lines in Montgomery County in 2014. In October 2012, the tree-trimming company Asplundh hired Jose Feliciano for one of its crews. Feliciano wasn't the singer known for the Christmas classic "Feliz Navidad." He wasn't even really Jose Feliciano. Less than a month earlier, he had been on the job as Danny Palao — and Palao's hiring supervisor at Asplundh knew it. Which is why Asplundh's chief executive was in federal court Thursday, agreeing the company would pay a record $95 million for violations of immigration law. Palao had been fired after having been identified as an undocumented immigrant working illegally but rehired by his Asplundh manager under the fake name. Same man, different Social Security number. Federal investigators assert the Willow Grove-based company used the same strategy to keep thousands of undocumented immigrants on its payrolls over four years — as many as 10 percent of its 30,000-person workforce, Assistant U.S. Attorney Josh A. Davison told U.S. District Judge John R. Padova in court Thursday. After accepting the company's guilty plea in federal court in Philadelphia, Padova ordered Asplundh to pay an $80 million forfeiture judgment. In addition, prosecutors said, the company agreed to pay $15 million more to satisfy civil claims related to similar immigration-related allegations. The issue of undocumented workers in the landscaping industry is not new. Such immigrants account for 21 percent of the industry workforce, according to a 2014 analysis by the Pew Research Center. It estimated 300,000 undocumented workers have landscaping jobs nationwide. "We will find you and hold you accountable," Thomas Homan, acting director of U.S. Immigration and Customs Enforcement (ICE), said in a statement. "Violators who manipulate hiring laws are a pull factor for illegal immigration, and we will continue to take action to remove this magnet." In a statement on the company website, chief executive Scott Asplundh apologized and pledged that the company cooperated and implemented changes in the last two years. "Consequently, the circumstances and practices of the past, which gave rise to the investigation, have been addressed and eliminated," Asplundh wrote, promising that the company would be vigilant in making sure "the situation does not re-occur." Asplundh removes brush and vegetation from electric and gas lines, with much of its work based on contracts with utilities including Peco, as well as other federal, state, and local governments. Founded in 1928, the company expanded over the decades and says it has employees working across the United States, Canada, Australia, and New Zealand. Prosecutors said that from 2010 to 2014, Asplundh used a hiring system that allowed top managers to remain "willfully blind" to the fact that undocumented immigrants were being hired with identification papers that supervisors knew were fraudulent. "This decentralized model tacitly perpetuated fraudulent hiring practices that, in turn, maximized productivity and profit," prosecutors said in their news release. Court documents show the hiring system was developed after a 2009 audit of Asplundh by Homeland Security Investigations, which revealed the company employed workers who were not eligible to work in the country. Asplundh fired at least 100 of them, according to the documents, but a regional manager, Larry Gauger, later instructed supervisors to hire some of them back by accepting fake forms of identification, including permanent resident cards or Social Security cards. Gauger, the documents said, "knew that the dismissed employees within his region were being re-hired under different and false names and false identity documentation and encouraged his supervisors and general foreman to continue this practice." Court records show Gauger has pleaded guilty and is scheduled to be sentenced next month, along with two supervisors, Juan Rodriguez and Jude Solis, who pleaded guilty in the same conspiracy. Solis was the supervisor who hired Feliciano, formerly on the books as Palao, in October 2012. Employers look to undocumented workers in part when they struggle to find low-wage laborers willing to toil under what can be grueling conditions, said Kevin Fandl, an assistant professor of legal studies in business at Temple University who served as counsel to the assistant secretary for U.S. Immigration and Customs Enforcement from 2007 to 2013. "An undocumented worker will want to operate as below the radar as possible, so they aren't going to raise a lot of complaints about pay or working conditions," such as being called up for an emergency at a moment's notice to travel to Florida or Texas to cut trees away from power lines, he said. "In that sense, they are a better employee." Davison said he stressed in court that there was no scientific formula to determine the amount of the forfeiture. But investigators determined that Asplundh used the fraudulent techniques to hire at least 10 percent of its workforce — or about 3,000 to 4,000 workers — in a four-year span, and earned $800 million in profits during that stretch. The idea of a forfeiture, Davison said, is to seize illegal gains, so the government reasoned that the illegally hired 10 percent of the workforce generated 10 percent of the profits. In his statement, Asplundh said the company has since hired a third-party compliance officer, instituted training for all hiring managers, and set up procedures to investigate any reports of undocumented employees. "As a business strategy, this is a good move," Fandl said. "You want to get a compliance specialist in there." That's because, he said, as steep as the payment is, Asplundh faces another, potentially more damaging, business challenge. Federal, state, and local governments could potentially decide that the company's criminal conviction would be a sufficient reason to "debar" it from further government contracts, an important part of its revenues. Last year, the privately held company paid a $187,718 penalty to the National Labor Relations Board in connection with violations at its Rocky Mountain, Va., location. The case was settled informally. In 2016, the company also paid the U.S. Occupational Safety and Health Administration nearly $88,000 in penalties stemming from workplace safety and health violations.